$45 for a semester of classes plus a final performance. Open to all children ages 7 to 14, no prior experience necessary. Come for the first class free--if your child likes it, sign them up! 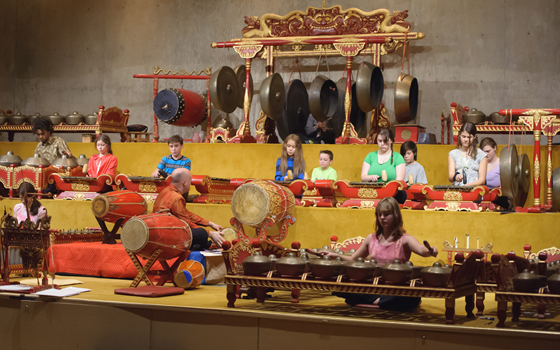 The Youth Gamelan Ensemble at Wesleyan was founded in 2002 by Artist in Residence I.M. Harjito, who guides the group along with Winslow-Kaplan Professor of Music Sumarsam and Director Joseph Getter. Students learn traditional music from Java, Indonesia on Wesleyan's gamelan instruments. Spring classes conclude with a performance with the Wesleyan Gamelan Ensemble on Thursday, May 2, 2019 at 7pm. Wesleyan owns one of the finest sets of gamelan instruments in the world, a set from Yogyakarta of mostly gong and metallophone instruments made of bronze. Register online here or call 860-685-3355.